In earlier days, people used traditional methods for grinding spices, nuts, and other eatable items. Things have changed ever since Mixer Grinder came into the picture. A Mixer is an electronic device that helps chefs mince vegetables, spices, and other edible items quickly. It costs within Rupees 1500, 2000, 3000 and up to 5000. People use Mixers for extracting juices from their favorite fruits. Mixers save time and money. They are one of the most important kitchen appliances. If you don’t have a mixer grinder yet or you’re planning to upgrade your MG, check our below list. MGs must have sharp blades to mince food quickly. The blades should be made from steel or aluminum because these two metals are durable. Iron blades may be affected by rust in the future. The 2nd most important component in a Mixer Grinder is the motor. The component is responsible for the grinding, blending, extracting, etc. The motor should be designed to serve for a long time. It must be power friendly. High-end Mixer grinders must have a lock system so as to prevent the motor from starting when the lid of container/jar isn’t closed. Preethi is one of the fastest growing brands in India. Its steel Max grinder is made up of stainless steel along with anti-fingerprint coating and matte finish. It has a smart design to prevent shock circuits and damages to the user’s property and devices. The highlighting feature of Preethi SM mixer grinder is its fast 750 Watts motor and has the option of four variable speeds, which grinding faster than underpower motors. The Steel Max mixer features turbo-vent technology and has 2 years warranty. It ships with multiple jars and you can use this device as a juicer. 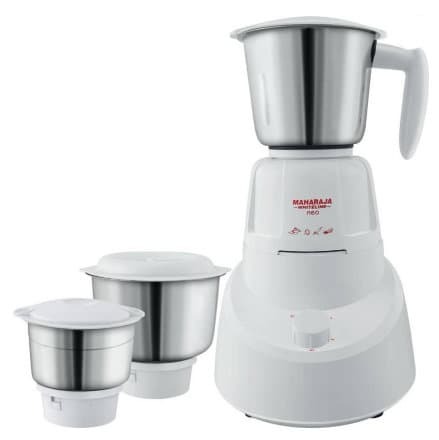 The Preethi Steel Max mixer grinder costs within 4000 to 4500 Rs. Whether it’s offline or online store, the Whiteline Neo Mixer is one of the best-selling mixer grinders of all times. MWN features jars built with the long-lasting stainless steel material so that you can use it for several years. It is shipped with a 1L, 0.7L, and 0.3L containers. The firm has installed a high-speed motor, which requires about 500 Watts of electricity supply. Its device supports three-speed mode of operation. The mixer is suitable for grinding items such as groundnuts, jaggery, coconuts, almonds, etc. Maharaja WN features rubber buds fitted at the base to prevent the mixer from slipping off. Its weight is about 3 kilograms. It costs between 1500 to 2000 Rs. A world-class company with several products under its name, Panasonic products have good ratings and excellent reviews from customers. The MX-AC300S Mixer Grinder carries a price tag below 4000 Rs and offers good features. Panasonic has equipped MX-AC300S with a powerful 550 Watts motor to support all types of edible products. It includes a double safety locking system to prevent accidents. Panasonic provides two years of warranty on its MX-AC300S mixer grinder. The device has beautiful piano type buttons and comes with three jars for different purposes. It is priced within 4000 to 5000 Rs (Best price). Kenstar is a company owned and operated by one of India’s most trusted brands i.e. Videocon. It is a firm which started its operations in 1996. Kenstar offers good after sales service and its products are worth the money. Its KMA50WS3S is a top rated product having 2299 grams weight. This device packs a 230 Watts motor and comes with 1.25L, 0.4L jars suitable for various purposes. It provides two-speed options. Like the above device, KMA50WS3S features stainless steel blades. The price of this mixie is below 2000. KMW50WS3S costs Rs 1900. Conclusion: As you can see above, mixer grinders are budget-friendly consumer electronic devices. You can use them for various day-to-day tasks. The devices have a shockproof design and have a good warranty. They are manufactured by top companies in India. Hence, you can trust the products.